You are a Leo woman personality if you were born between July 20th and August 20th, depending on the year. The Leo woman has many admirable zodiac traits that go along with her sun sign of the lioness. She is proud of herself and all her accomplishments, and she always has more goals that she is getting ready to conquer. The Leo lady is a proud woman. One of the Leo female’s largest goals in life is to be her own boss, or to be the boss of her dream job. The Leo woman personality traits also show she wants to be able to give the orders instead of following them. This lioness wants a job that comes with power and status, and she isn’t afraid to work as hard as she needs to in order to accomplish this goal. 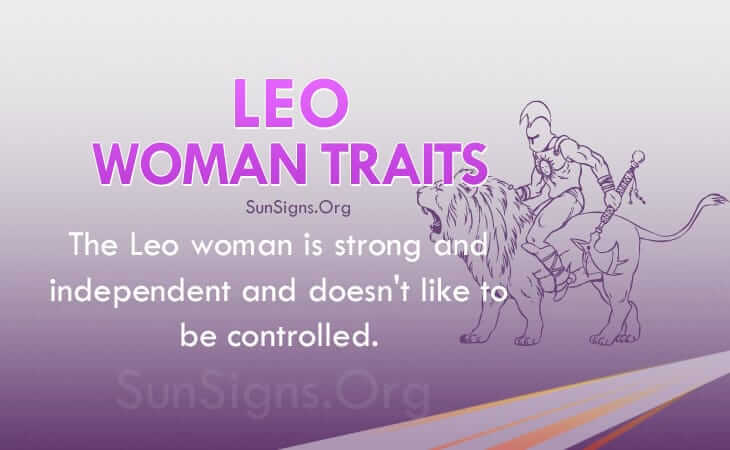 The Leo woman traits show she is strong and independent. She doesn’t need anyone around to tell her what to do. She would prefer that no one told her what to do. The Leo lady aims so high because she dreams of being the center of attention. She adores it when people are paying attention to her, asking her questions or advice, and she especially loves it when other people listens to what she has to say. The Leo woman characteristics show that younger women are likely to join a theater group in school, or join an important school government committee to prove that they have talent and determination. Both of these activities are great for young Leo girls, as the groups help them to grow as a person. It also helps strengthen their communication and self-confidence. Leo females are often creative, even if it might not be in the traditional sense of painting or drawing. The Leo woman is likely to want to show off her skills, and often in a creative way. She may put on a show or have an elaborate discussion planned out at work. Joining groups at a young age can also help the Leo girl decide what she wants to do when she’s older as well. This like this help to ignite the passion that can burn for years to come. The Leo woman personality traits also show she has a flair for creativity when it comes to fashion. This isn’t to say that Leo women dress oddly to try to express themselves. It’s just that they often try to dress expertly, in the latest styles and in the colors that look best on them. They know that their appearance can make or break a first impression, so they are willing to put some time and money into their look. The Leo woman traits show she thinks rather highly of herself, and she won’t let anyone treat her poorly. If a Leo woman is insulted she’ll let the offending party know it. The Leo female isn’t one to let anyone push her around to tell her what to do either. She wants her independence, and she won’t be happy without it. She’s willing to work hard if that’s what it takes to get what she deserves. But she’ll never give up on the dream of becoming her own person and doing what she likes. Since the Leo woman doesn’t like to be controlled, it is not likely that she will try to control her friends, family, or partner. She will only boss around people when she needs to, like when she is telling someone what to do at work. The Leo woman characteristics show she gets a thrill out of being in charge and having added responsibility, but she doesn’t want to make others feel poorly because she’s in charge. She will be a good boss once she is one, and she will respect her workers like she would like to be respected. When in a relationship, the Leo woman personality will want to be in control. Of course she will respect her partner’s wishes, but she will want to be able to make all of the important decisions. Leo women has a desire to be the best, and they won’t settle for a partner who doesn’t share this passion and determination. She is a passionate and seIf she can find a partner like herself, then things will be wonderful between the two.